This entry was posted in Agriculture, Green living, Health, Policy, Sustainable development, Uncategorized and tagged Economic Development, Green Eating, Local Economies, Small Business on November 9, 2011 by Katheryn Thayer. On Tuesday November 1st, Congresswomen Chellie Pingree, with Senator Sherrod Brown, submitted the Local Farms, Food, and Jobs Act (LFFJA) – S. 1773 and H.R. 3286, as part of the 2012 update to the Farm Bill, a major piece of legislation that dictates America’s agricultural policies and programs, and is renewed every 5 years. Pingree and Brown’s bill integrates support for local food producers and consumers into the upcoming adjustments the Farm Bill will see in 2012. And the benefits of local food systems goes beyond economic growth. In a study of farm costs and food miles, researchers led by J.N. Pretty found that if Britain’s globalized food system switched to local food sources (within 20 km of home), the environmental costs would fall from £2.3 billion annually to £230 million annually, a reduction of more than half. The Center for a New American Dream calculates that food travels an average of 1,500 to 2,500 miles, in fossil-fuel burning transportation, to reach consumers, and that local farms not only eliminate the pollution associated with transportation, but also, regardless of whether they are certified organic, use less chemicals and protect biodiversity with wider agricultural gene pools, supporting long-term food security. The Local Farms, Food, and Jobs Act works toward these environmental benefits by supporting rural, entrepreneurial, community-based, and independent farmers with financial programs, research initiatives, and business incentives and support. The bill will make Farm Service Agency credit more accessible to local and regional farmers and ranchers, allocate $30 million annually to Value-Added Producer Grants, improve the Risk Management Agency’s insurance coverage for specialty crops and mixed operations, facilitate Organic Certification, make room for commodity program participants to grow fruits and vegetables, provide Rural Business Opportunity Grants, Rural Business Enterprise Grants, & Community Facility Grants & Loans to local and regional food systems, put $30 million a year towards farmers’ market promotion, give $90 million annually to the Specialty Block Grant program, and create a special budget for local and regional crop and market development. Pingree and Brown offered the bill to a wave of food-policy advocacy support. It appears to be strategically released to coincide with the Center For Science in the Public Interest’s Food Day, a nation-wide event advocating food, hunger, and sustainability on a grass-roots level with goals of creating food policy. Pingree’s legislative director, Claire Benjamin, explains, “Congresswoman Pingree worked on developing the ideas in the Local Farms, Food and Jobs act through the course of the last 10 months with input from a broad coalition made up of 18 farm, nutrition and food security organizations. The timing worked out well to use Food Day as a platform for announcing the bill”. Benjamin also expressed support and encouragement of the first annual Food Day, calling it, “a great success and huge organizing opportunity for people who care about these issues”. The quick and concrete government response to the Food Day campaign is exciting to both farmers and consumers, and is being awarded huge support and endorsement from groups such as the National Farmers Union, Community Food Security Coalition,American Farmland Trust, and the National Farm to School Network. Speaking to Western Farm Press, the National Sustainable Agriculture Coalition’s Helen Dombalis said, “We applaud Senator Brown and Congresswoman Pingree for introducing this legislation, which is important to farmers and consumers alike”. However, the actual impact of this bill can be called into question when considering that none of the initiatives are allocated more than $100 million dollars. This seems like generous funding, until we consider that the last Farm Bill, passed in 2008, was a hefty $288 billion dollars. What’s more, U.S. Agriculture Secretary Tom Vilsack is planning to reduce the 2012 budget by as much as $23 billion, and indicated that sustainable, community-based initiatives will be cut, saying in an interview, “We’ll have fewer dollars for rural development but we’re looking to partner with non-profit foundations to pick up the slack”. Vilsack expressed a disregard for government responsibility for small and sustainable farmers, even though it that same interview he lauded the merits of organic and small farming, saying, “Four percent of the nation’s farmers are organic but it’s a fast-growing segment. The farms are usually small but provide a great strategy for rebuilding rural America”. Pingree’s office hopes that the modest monetary requests and soundness of investment will translate to a well-received bill. Benjamin says, “the Local Farms, Food and Jobs act makes up a fraction of the costs of the overall farm bill, and we feel like the spending in the bill makes strategic investments in a growing sector of the economy,” and goes on to point out that several of the proposed initiatives don’t even have price tags attached, saying, “Many of the provisions in the bill are common sense, no cost policy changes that would significantly bolster this growing sector of the economy, and help consumers access healthier, local food”. Regardless of budget size, the government accountability to constituents’ interest in sustainable food and farming is a promising spark of political action, and with more discussion, awareness, and advocacy, is likely to build momentum. If Food Day championed such legislation in its very first year, Americans interested in food and farm can be optimistic about their potential for further change. This entry was posted in Agriculture, Energy, Green living, Health, Uncategorized and tagged Consumer Activism, Cultural Acceptance, Eating Green, Small Steps on November 2, 2011 by Katheryn Thayer. Vegetarianism seems oppositional to American life; as a culture, we stand fiercely loyal to fast food, barbecues, and steak knives. It is such a part of our national gastronomic tradition that even its proven harm to health cannot deter our meat-eating ways. We have long ignored that saturated fat from animal-protein is connected with cardiovascular disease and certain types of cancer. But in 2006, the Food and Agriculture Organization of the United Nations produced a document that would change the world’s understanding of how our food affects our environment. Livestock’s Long Shadow announced “livestock are responsible for 18 percent of greenhouse gas emissions, a bigger share than that of transport”, creating emissions from feed production, cultivation of feed crops, organic matter losses, feed transport, animal production, and product transportation”. Even still, most Americans continue their meat-based diet because, simply put, they like meat. Regardless of objective arguments for removing meat, or just beef, from the diet, only 3.2 percent of the American population adheres to a vegetarian diet, according to a survey conducted by Harris Interactive Service Bureau for Vegetarian Times in 2008. But in addition to this small population of strict vegetarians, the Harris study found another 10 percent of American adults follow a “vegetarian-inclined” diet, and another 5.2% are “definitely interested” in adopting a vegetarian-based diet. For many, meat is becoming a lesser, rather than absent, part of the diet. Al Gore, arguably the nation’s most vocal and visible environmental advocate has said, when asked why he doesn’t adopt a vegetarian diet for the environment, “I’m not a vegetarian, but I have cut back sharply on the meat that I eat”. Even an environmentalist can find it hard to give up meat, but more eaters are seeing that just taking steps in the right direction is an important part of addressing the environmental harm of beef. As Barnard biology professor and food specialist Hilary Callahan states, “A key and incontrovertible ecological principle is that eating lower on the food chain saves energy and makes more food available for more people. This applies for terrestrial systems (avoid beef, pork, chicken, others) and for marine systems (avoid eating predatory fish)”. Considering that transporting, processing, producing, retailing, storing, and preparing 1 kilogram of beef, cheese, and pork creates as much as 30 kilograms of CO2 while fruits and vegetables are associated with 2.5 kilograms of emissions per kg of edible end-product, even moderate dietary reassessments could dramatically change the food system’s impact on global warming. Regardless of “vegetarian” or “meat eater” labels, a part-way shift from carnivorous to herbaceous meals could have appreciable impacts. A variety of organizations, from the UN Intergovernmental Panel on Climate Change to the Humane society to Stanford University are advocating a new, but practical diet. They invite a wider range of eaters by reporting the environmental and health advantages of reducing meat consumption, while understanding that quitting cold “turkey” can be too much to ask. 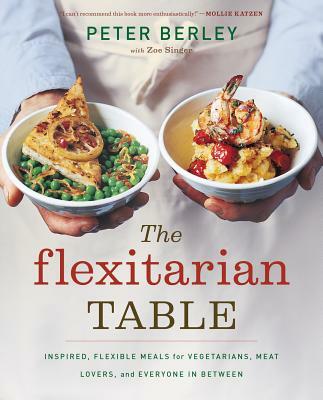 This trend, dubbed “flexitarianism” has produced a bevy of cookbooks, including The Flexitarian Diet, The Healthy Hedonist, and Everyday Flexitarian, as well as recognition on The Daily Beast and The Huffington Post. Mainstream eaters are being challenged to eat more vegetables, try cooking just one vegetarian meal a week, or buy sustainably-raised, grass-fed beef. The focus of flexitarianism is to introduce a form of vegetarianism that is easy and approachable.